Wanted to make a shawl for a friend to brighten her day after she admired my recent Anzula make. Found a beautiful variegated skein in the sale bin at the yarn store where I work. I watch those sale bins like a hawk! Found a suitable pattern on Ravelry the Elise Shawl. 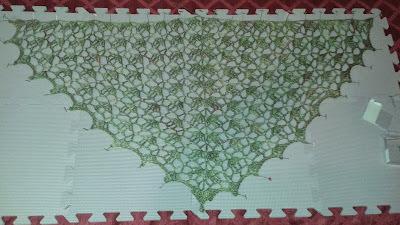 It's more a shawlette but we'll see blocking can work it's magic!